Game #10 Heavyweights on the mound tonight in Philly! Last night’s game between the Nationals and Phillies showed how evenly matched these teams are, but the Nationals are playing without one of their stars, Trea Turner, and a bullpen that is trying to find their way. The Phillies have everyone healthy and it showed. The game did not have a playoff feel as the Phillies did not have a big crowd on-hand on a perfect night for baseball as it was unseasonably warm and no precipitation. Maybe the fans are waiting for tonight’s heavyweight bout between Stephen Strasburg and Aaron Nola. Last week, the Nats really took it to Nola. The Nats scored 6-runs in just 3 innings off of the Phillies ace and sent him to the showers early. 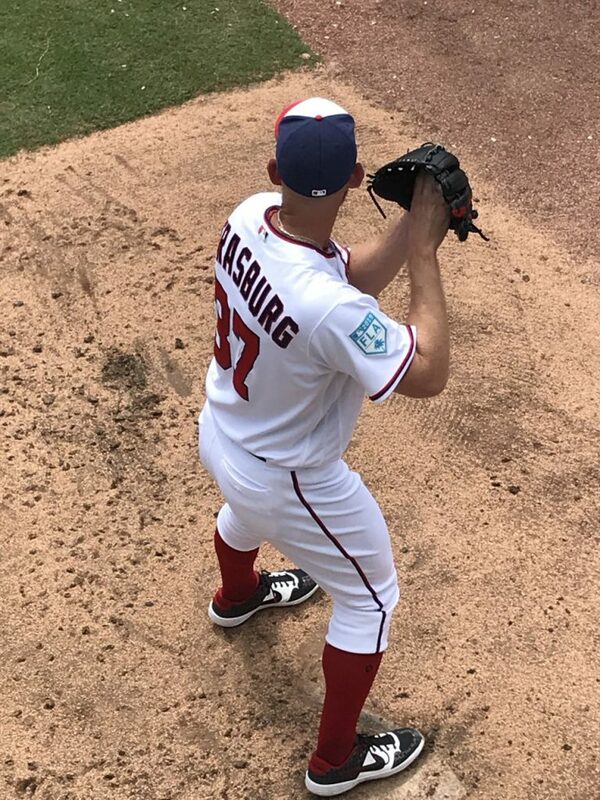 Strasburg is coming off of the best start of the Nats young season as he threw a 6 2/3 inning shutout against the Mets. Much of the Nationals bullpen got rest last night except for Wander Suero, Justin Miller, Kyle Barraclough and Tony Sipp. While “Everyday” Matt Grace warmed up along with Sean Doolittle, neither reliever made it into the game. One of the promising signs in last night’s game was Brian Dozier‘s home run. He squared up a pitch from Pat Neshek and sent it over the wall in deep centerfield. If Dozier could heat up, it would be a real plus for this team that got production from most of the batting order. The issue was putting together long innings that scored runs.